2018: Your year to become a CHIA - CHIA "
It’s a new year, digital health technologies are increasingly being implemented and the importance of the profession of health informatics is becoming widely recognised. Do you want to indicate to employers and funders that you have core, up-to-date knowledge of health informatics? Are you wanting to advance your own professional development? 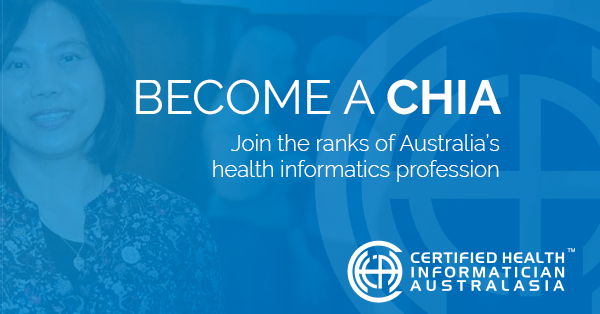 Are you committed to the profession of health informatics? ⇢ “gave me a skillset and network that I can use to help pioneer and progress digital health and informatics in the physiotherapy profession”. Our healthcare system is changing a properly skilled health informatics workforce is the foundation of safe, effective healthcare. 2018 is your year. With the implementation of a new exam platform and a new bank of exam questions, start planning your goals. Register today to become a CHIA.